MuniMae recently changed its name to MMA Capital Management (MMAC), instituted a reverse split and up-listed to the NASDAQ from the pink sheets. I invested in MMA Capital back in the spring with the basic thesis centered around GAAP accounting obscuring some of the underlying value in this post crisis busted financial. Read the old post for the background story, but a couple transactions have happened since March to move items from the "grab bag" asset pile to the easy to value pile making balance sheet adjustments a little more straight forward. MMA Capital operates a multi-family real estate asset management company in South Africa called International Housing Solutions (IHS). IHS closed on their second multi-investor fund ($70MM) in the second quarter, and at the same time MMA Capital increased their ownership stake in IHS from 83% to 96% for $1.6MM. 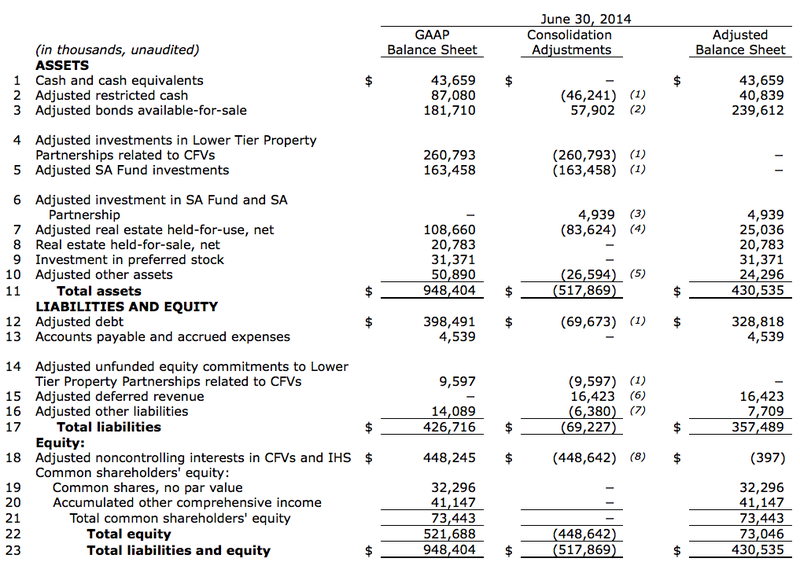 The GAAP balance sheet doesn't give credit for IHS at all, and the company conservatively only adjusts for their own investment ($3.7MM) in the South African funds along with the company's equity balance ($1.2MM) in the management company. This understates the value of the management company greatly, by taking the $1.6MM valuation for 13% of IHS and interpolating it over the 96% ownership stake and MMA Capital's equity in IHS should be closer to $11.6MM. Add the $3.7MM fund investment, and the company's total SA fund investment line item is worth $15.34MM. Today MMA Capital announced they sold their LIHTC funds business to Morrison Grove Management for $15.9MM. This is the tax credit business that causes most of the accounting problems, and unfortunately those won't be going away as MMA Capital will still be on the hook for the investor yield guarantees. However it does unlock the value of the business that was previously hard to quantify and wasn't on the balance sheet. MMA Capital is providing seller financing for the entire amount, including a $17.3MM senior bridge loan and in $13MM subordinated debt for a total cash outlay of $14.4MM. MMA Capital is providing the bridge loan so Morrison Grove can buy out certain outside ownership interests, the loan is due in December with penalties if extended. But the end net effect will be additional net $15.9MM added to the adjusted NAV. The company also negotiated an option to purchase Morrison Grove starting in 5 years time, so the company monetizes the business today and maintains some of the future upside. Using the reverse-split adjusted share count of 7.9 million, the adjusted book value per share is $9.25, well above its close today of $8.41. If you make the additional adjustments for IHS and the Morrison Grove transactions, the adjusted book value is roughly $12.50 per share. This doesn't include the $400MM in NOLs and their REO assets which could have significant value. The company has also been repurchasing stock regularly with a maximum price of $9.60, every time they buyback stock below book they drive the NAV up even further. So why didn't the stock price react on today's news? MuniMae/MMA Capital was already a forgotten company, but with the name and ticker change it almost seems like very few people are still paying attention anymore. The up-listing and reverse split could potentially widen the investor base, which should make it easier to raise capital to expand the business and monetize those NOLs. Management has made admirable progress in 2014, and I think it's arguably cheaper now than it was back in March at prices 40% lower due to value highlighting transactions made recently.